Dental Implants or Implant Dentistry? What's the Difference Between Dental Implants and Implant Dentistry? "Dental implantsâ€ is a widely used term, but many doctors also use the term â€œimplant dentistry.â€ Whatâ€™s the difference? Dental implants are by definition artificial tooth roots that are placed below the gum line to support restorations that take the place of one or more teeth. Over the years, the term â€œdental implantâ€ has expanded to include not only the artificial tooth root, but the restoration. When someone says, â€œI have dental implants,â€ they usually mean implant-supported restorations, not just the implants themselves. The term â€œimplant dentistryâ€ is broader and more descriptive, because it covers the entire discipline of dentistry related to replacing missing teeth with implant supported restorations. The discipline of implant dentistry includes diagnosis, treatment planning, the surgical and restorative phases of dental implant treatment, and follow up. The bottom line is that â€œimplant dentistryâ€ is more comprehensive, but the phrase â€œdental implantsâ€ is commonly understood as a shorthand for dental implant treatment. Dental implants can vary in cost. Many patients have questions about the cost of dental implants. To determine the fee for a specific case, the doctor must first take careful records, including x-rays and a complete health history, and develop a customized treatment plan. At TeethToday, all patients receive a free consultation exam that includes a free dental x-ray. The purpose of the consultation exam is to allow patients to come to the office, spend time with the treatment coordinator, meet the doctor, and leave with an understanding of their dental needs and a range of fees specific to their case. After the consultation exam, patients are invited to return for a complete dental examination. There is usually a fee for that second, diagnostic examination, but that fee is applied to the dental implant cost of treatment. TeethToday offices provide patients with a variety of payment options to help make dental implant treatment affordable. Before any treatment begins, patients have the opportunity to ask questions and choose from a number of payment plans, including some with either no interest or low interest for a period of time. Dental implants have many benefits. One of the great benefits of dental implants is that they never require root canals. Sometimes root canal therapy is recommended to save a natural tooth, but dental implants consist of prosthetic teeth that are firmly anchored in the jaw with artificial tooth roots. Dental implants look and function just like natural teeth, except that they are not subject to cavities and they never need root canal therapy. Dental implants are long-lasting tooth replacements that give patients piece of mind. While excellent home care and regular dental visits are highly recommended to prevent periodontal disease, the implants themselves are extremely durable. With proper care, most dental implants last a lifetime, and they eliminate any possibility of needing a root canal. Dental implants offer many cosmetic benefits, including preventing the appearance of premature aging. When someone is missing teeth, they also lose supporting bone over time. Itâ€™s like putting a bar of soap in the shower and turning on the waterâ€”the soap melts away. When teeth are missing, the jawbone tends to atrophy or shrink over time. As a result, some patients may look older than their years, because their face takes on a sunken appearance. Dental implants and the resulting ability to chew help to stimulate the bone and keep it healthy. 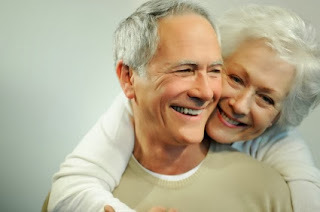 In addition to the many other practical and functional benefits provided by dental implants, they also help to preserve bone and keep patients looking vibrant and healthy.